Rapid technological advancements have significantly characterized life in the 21st century. We are living in an era where the internet, software, gadgets, apps et cetera have permeated almost every aspect of our lives. One aspect which has been particularly affected by the techno-revolution is photography. Photography in the 1950s and photography today are two polar opposites. Yes, the basics are the same but the job of the 21st century photographer is characterized by highly sophisticated cameras and most importantly relevant to this reading, good photo editing software such as Fotoworks XL. Photos rule the online world today and so does photo editing software. Try going through a person’s social media timeline and you’ll be hit with a sickening load of photos for all kinds of events; graduation, one with nature e.g. This craving for photos and photography created by social media and the internet has necessitated the need for good photo editing software. Fotoworks XL as tool could not have come at a more perfect time in human history. Fotoworks XL is a simple photo editing software you find here http://www.fotoworks.org/photo-editing-software/ for download. It can be easily used by seasoned photo and graphics editors and amateur editors alike. This simplicity is embodied by the organization of the software’s user interface. Many a time, photo editor is presented in a very sophisticated manner which is cumbersome to look at and sends an amateur editor into confusion. This has been laid to rest by Fotoworks XL software. With the crucial photo editing tools openly displayed, one can easily spot and pick their favorite tool for use. The editing menu is clearly displayed on the right where automatic editing tools for beginners and hands on editing tools for seasoned editors are placed. Here, the editor may tweak the image to exactly what they want. In doing so, the photo editing software displays a comparison window where comparison of the original image can be made alongside the edited preview while making the necessary alterations. The photo editing software comes packed with all the necessary photo editing features which may be expected of a worthy photo editor. The simplicity presented by the interface combined with the various tools and editing features create a package which is easy to use. It’s a package whose quality is guaranteed. To make it more interesting, the photo editing software free download is just a click away on the internet. Once this software free download is acquired, one may do away with any unnecessary expenses incurred in procuring the external help of photo editors since one may use this photo editing software for pc. Now, you may enjoy editing your own photos be it vacation, weddings, birthdays or any event for that matter without any problem through the use of the Fotoworks XL photo editing software. Fotoworks XL is an easy photo editing software for PC since it can be used by all groups like young, old, amateur or professionals. Fotoworks XL is compatible for wide range of operating systems (OS) such as Windows 10, Windows 7, Windows 8, Windows Vista and Windows XP. However, in every OS the user can have access to limited features of the software. This is very advantageous to the software user since the cost of purchasing new software is eliminated because the software is compatible to a wide range of operating system. An upgraded OS results to an upgraded version of the software. Photo editing software windows 10 enables the user to access features on the software such as eliminating ‘red eyes’, and pictures can be stored and transmitted as JPEG forms which is useful because space and cost of storing and sending respectively is reduced. Photo editing software windows 7 is basically useful when trying to correct blunders made when taking the picture such as shadows. Fotoworks XL similar to the other software gives users the opportunity to create images that are amazing without blemishes. It has proven to accommodate both amateurs and professionals in that both get to produce good pictures with an absolute ease and simplicity. Users get to produce “wow” photos with characters, themes they had intended to be displayed using features such as removing or adding objects, brightening or contrasting and many others. The photos created will capture audience attention be it in occasions and activities such as weddings, calendars, and advertising images among others. The photo editing software is reliable because it has an amazing customer service available from time to time making sure the customers/users are having the best time and are able to access the software without any difficult. In conclusion, the Fotoworks XL is a photo editing software one should try out if looking for an awesome experience. Developers of this software have gone out of their way and are currently still upgrading the software into a more appealing version. For instance, the latest version of the software Fotoworks XL 2019 is exciting and amazing with its additional features like masks effects, automatic straightening among others. Its friendly and professional customer service team is able to communicate with customers as they get suggestions and recommendations on where to improve thus being able to suit the needs of many. “FotoWorks XL”, this product has so many functions for editing photos. All the functions are well arranged in a clear menu structure and even better, you can see the original picture and the edited version. This is so that you can have better control over your photos. FotoWorks XL photo editor is suitable for every person who wants to edit their photos be it a beginner or an advanced user. This photo editing software for Windows 10, Windows 7, and 8 provides you with a large photo editing and printing functions. You can edit the photos for photo albums, photo calendars or photo montage. There is also a fantastic photo collage maker and several batch processing routines. For instance, you can easily add a copyright watermark to all your photos using this photo editor so as to prevent theft just in case you would like to publish the images on the web. With so many functions and features, you can easily convert your digital photos into what you want within a few minutes. FotoWorks XL is a photo editing software that has so many integrated functions for photographic effects, editing so as to make photos look like a unique piece of art work. You can try out this amazing simple photo editing software for image editing. FotoWorks XL is suitable for all users and it has all the main functions for photo editing you know about. This is a very powerful photo editing program and image editor that is very intuitive and despite the numerous options and tools offered, you do not require any training period for you to be able to use it. FotoWorks XL is an easy photo editing software for pc and anyone can use it easily. FotoWorks XL photo editing software is aimed at users who would like to enhance photos, edit photos, rotate photos, crop photos or want to use the other effects of this software. You can also include texts, icons, clipart, or any other image using this photo editor. Whether you want to create an photo collage or a complete folder of reduced images in batch mode, this automatically improves them. This software combines some of the most advanced features and image manipulations such as light reflection effects, preset effects, watermarks, masks, sharpener/blur, and textures. FotoWorks XL is then completed with a printing studio meant for photo albums, posters or calendars. In the world, top editing software is used daily by so many people but it is quite challenging to get the industry-specific that is not suitable for beginners. FotoWorks XL has come up with a solution for this problem by offering users with the right photo editing software so as to produce photos that are professional and there is a minimal training time. This is a simple photo editing software that provides you with a help function that has a built-in instructions sections that clearly explain all the features. This means that even novices can try the photo editing software free download and confidently start editing photos. Whether you are a beginner or an advanced user, FotoWorks XL is the perfect photo editing software for you. This is easy photo editing software for PC and anyone can start editing their photos using this software. If you are a first-time user you can rest assured that this photo editor and all its features are aimed at making the whole editing process more accessible and enjoyable by anyone. The functions and features of this photo editing software are clearly presented in a very organized manner and the details are very comprehensive. This works by making the photo editor appropriate for first-time users since they get a visual learning assistance that shows every enhancement and correction in the editing process. FotoWorks XL is software that is committed to providing a very interactive editing experience that is easy and affordable to use. If you are looking for a photo editor that will give you the most professional and high-end results, then FotoWorks XL is perfect for you. Get the photo editing software free download and make use of all these amazing features and functions. FotoWorks XL is a photo editing program that has all the best features from a successful and popular photo editing software. 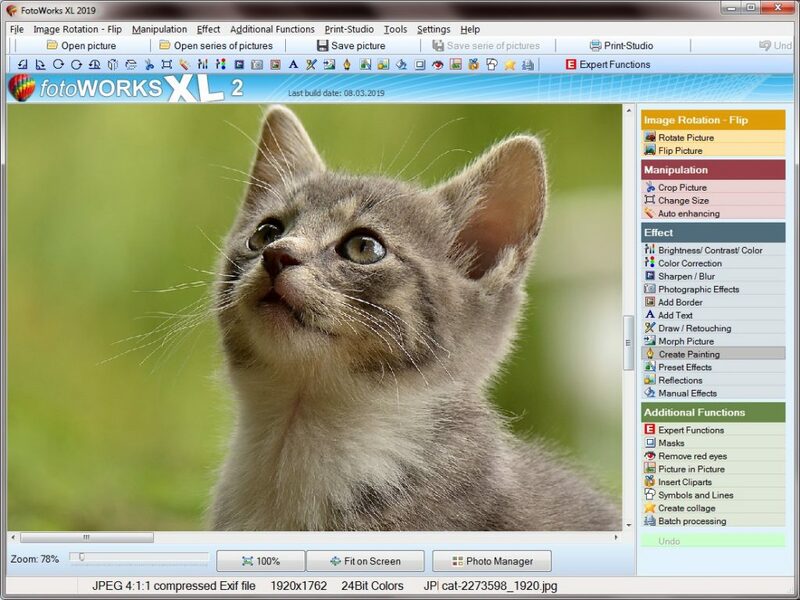 FotoWorks XL is a simple photo editing software for windows and PC. The software can be used with Windows, 10, Windows 8, Windows 7, Windows Vista, and Windows XP. 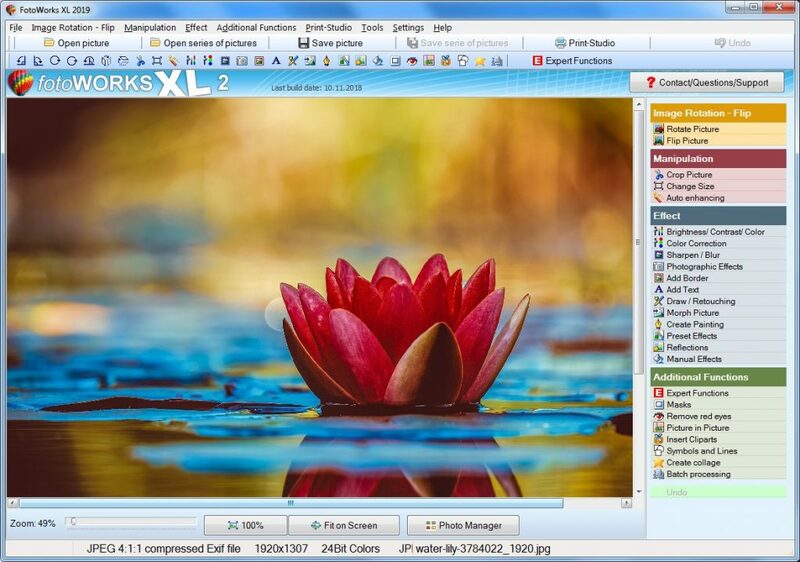 FotoWorks XL is very easy to use software that enables you to edit your digital photos very easily. It has a variety of functions that are for the imaging software and they are clearly arranged which makes it easier to handle. This software provides a wide range of image editing, printing, creating collages and batch processing functions. You can try out this good photo editing software and make your photos better. All the main functions for photo editing software here http://www.fotoworks.org/photo-editing-software/ like image manipulation, filters, photo effects, masks and many more can be found in this image editing software. With the picture editor functions such as texts, light reflection effects, color correction, color adjustment, blur, sharpen, auto-enhancement, brightness, cropping, texts, preset effects, and contrast are very easy with this photo editor. You can perform changes such as moving objects into another photo, copy & paste objects, photo montage, remove objects and clone stamp tool. This is an easy photo editing software for pc and Windows. 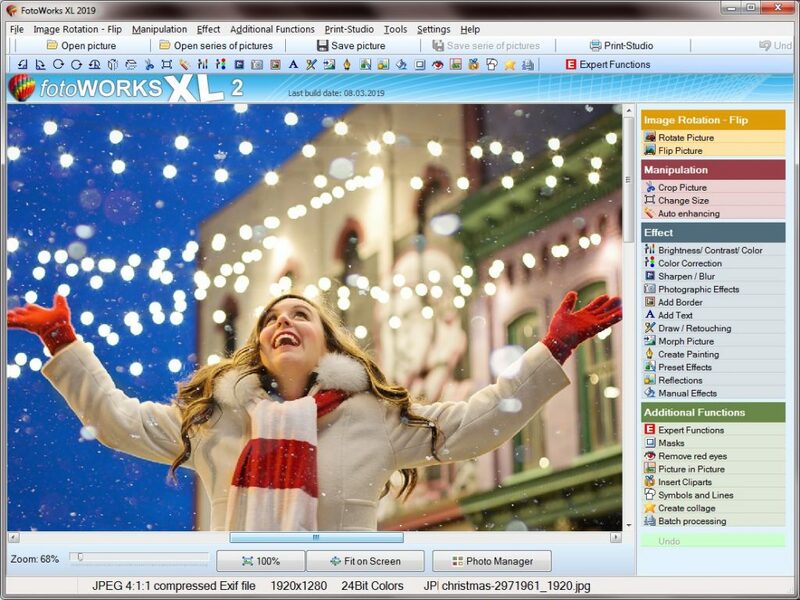 FotoWorks XL has all the functions that are required for photo editing. This is what makes it a successful photo or image editing software. FotoWorks XL is intuitive editor that has a wide range of options and so many tools. One advantage of this software is that it does not require any training period. This editing software is meant for users who want to perform various functions. For instance, it could be for editing photos, rotate, crop, enhance photos, or other numerous effects. You can also include clipart, texts, icons and other images. It doesn’t matter whether a photo collage is to be created or a whole folder reduced photos in batch mode, this improves them automatically. You can also convert them to black or white. The photo editing software for pc and Windows combines image manipulations with some advance features like preset effects, watermarks, masks, light reflection effects, sharpener/blur and textures. All these are the amazing works of the FotoWorks XL. With all these amazing features and functions there is no easier photo editing software Windows 10 for you to use other than FotoWorks XL. You can get the photo editing software free download and give your photos a digital look that appears more professional.